Just as the weather is warming up, winter is here. The wait is finally coming to an end, and on April 14 the final season of Game of Thrones will finally grace our screens. 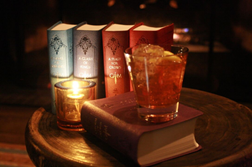 To celebrate this monumental event, The Library Bar at Hudson Hotel is offering a limited time Game of Thrones cocktail menu for the entire new season and two trivia nights on April 15th for the true fans. 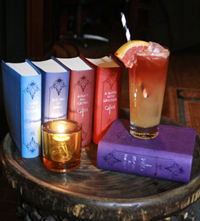 Each drink draws inspiration from the show’s iconic characters and nuances. 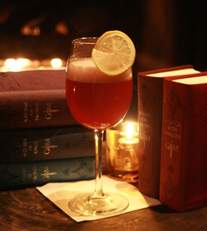 Winter is Coming, named after the famous Stark family saying, will keep you warm with its rye whiskey and mixes of sweet and dry vermouth. 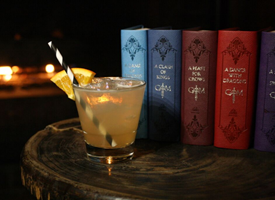 Mother of Dragons, a cocktail that embodies the strength and courageousness of Daenerys Targaryen, pleases with splashes of pineapple and lime juice with a kick of Mount Gay black barrel rum. A Lannister Always Pays Their Debts makes one feel like a Lannister royal with its infusion of port wine and cognac. 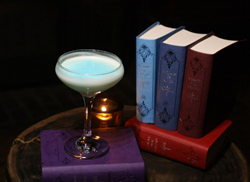 The White Walker cocktail won’t have you reaching for the dragon glass with its infusion of vodka, lemon juice and coconut creme. Finally, the Beyond the Wall cocktail will finally satisfy your unanswered questions with its citrus flavors on what is truly beyond the wall. No matter if you’ve been following since the beginning or if you decided to binge watch it a week ago, these drinks are must have in welcoming in the final new season of Game of Thrones. Combine all ingredients, stir and pour over ice into a rocks glass. Garnish with a lemon twist. Combine all ingredients, shake, and pour over ice in a tall glass. Top with a 5-6 dash of bitters for falling red drip. Add for grapefruit garnish. Combine all ingredients in a shaker, shake and pour over ice in a wine glass. Then, fill up to half with Cava with a cherry. Garnish with Citrus Slice. Combine all ingredients in a shaker, shake and pour in a coupe glass. Spray top of cocktail with Blue Curaçao to achieve the blue color. Combine all ingredients in shaker, shake and pour over ice in rocks glass. Top with club soda. Garnish with orange slice.